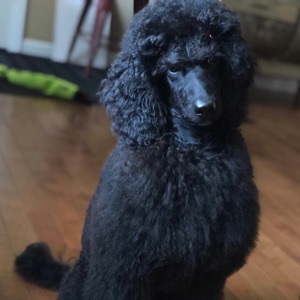 Anise is a black seal medium poodle with an excellent AKC pedigree from inter-variety breeding. 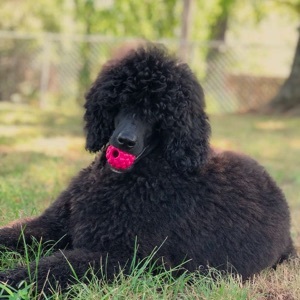 She was born here at Noir Poodles; Kiaya is her mom. Anise should mature around the size of Kiaya. Her sire, Bobby, lives in Italy. 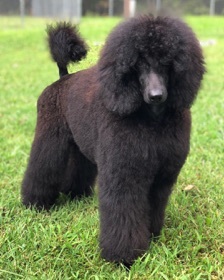 Bobby became an AKC GCH and won Best In Show at the Hershey and Atlanta grooming competitions during the year he lived in the states. Anise is very intelligent and affectionate. 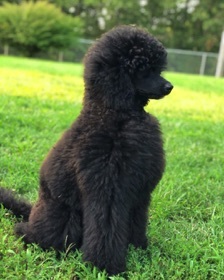 Her litter was the first litter I raised using Puppy Culture We enjoy training together in classes at the Springfield Missouri Dog Training Club. We are currently working towards performance in Rally, Obedience, Scent, and Agility. She will also start Tracking classes soon. Anise's health testing is started, including genetic diversity VGL testing. 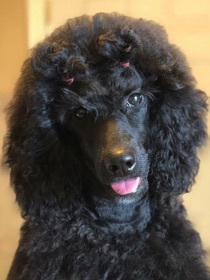 Some of her health testing will be completed after she is one year old. She can produce black, brown, seal, and parti colors.